Just relaxing by the sea. Photo by Steven Lomas. Several young seals have been spotted this evening basking on the South Shields coast. Gazette reader Steven Lomas captured the adorable creatures as they enjoyed their time on the land at tea time near South Shields Pier. High five from this cool dude. Photo by Steven Lomas. 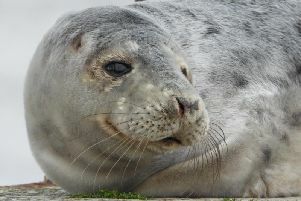 Steven said: "There were at least three baby seals resting on the stairs and one was actually resting right near the lighthouse. "Absolutely fantastic to see them using the pier as places to rest and warm up."